1. Educate yourself about fleas. Fleas can live for as long as 12 months and produce millions of offspring in that time frame. Photography ©R.Tsubin | Getty Images. 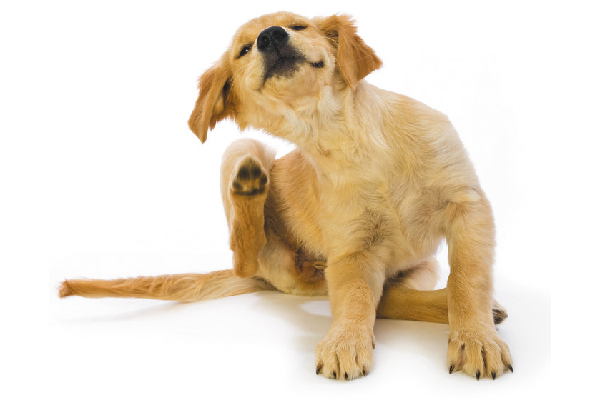 Fleas can live for as long as 12 months. During that time, fleas may produce millions of offspring. Fleas can jump up to two feet high. They are persistent in their environment (a.k.a. hard to get rid of!). 2. Learn the symptoms of flea bites. Flea bites have certain distinct characteristics. The bite may immediately cause a dog to feel extremely itchy. Within 30 minutes of a bite, your dog may develop a red bump. Secondary infections caused by scratching are also common. 3. Know how to treat the flea bites. Wash the bites with antiseptic soap, as recommended by your veterinarian, to reduce the risk of infection. 4. Learn how to eliminate fleas in all stages. The flea life cycle includes adults, eggs, larvae (maggots) and pupae (the cocoon stage). Typical insecticides do not eliminate the pupae. Use an insect growth regulator to break the flea life cycle. 5. Get rid of stray fleas. If your dog picks up a “hitchhiker” flea while outdoors, use an adulticide medication that kills adult fleas. Talk to your veterinarian about the best product for your pet. 6. Regularly check your dog for fleas. Don’t wait until you see your dog scratching. Frequent brushing will help spread natural protective oils over your pet’s coat, reduce shedding, and give you an opportunity to look for fleas. Keep your pet away from areas known to have flea problems. Not sure if the local park is safe? Do your homework to ensure the local dog park has a good flea control program. Don’t just check your dog for fleas — treat his environment as well. Remove underbrush from trees, and rake leaves where fleas and ticks may lurk. When spraying the yard for fleas, concentrate on the areas where your pet spends most of his time. Eggs and larvae will likely be shed in the spots where he lies down. In-home extermination should focus on upholstered furniture, rugs, and carpeting. Vacuum all floors prior to home treatment and check with your professional exterminator to see when it is best to vacuum following treatment. If your pet sleeps in your bed, wash sheets and pillowcases in hot water and regular laundry detergent. Vacuum the mattress and consider buying new pillows. 10. Use year-round preventive care. Waiting too long to use preventative treatments before flea and tick season comes around could be dangerous for your dog. Protect your dog year-round to avoid an infestation. Ask your veterinarian about which product is best for your dog and be sure to read the label carefully before administering the medication. About the Author: Dr. Lynn Buzhardt practices small-animal medicine along with her husband, Scott, at their veterinary hospital in Zachary, Louisiana. She has more than 30 years of experience working with pharmaceutical companies and the FDA in product discovery, protocol review and new drug development. The post 10 Tips for a Flea-Free Home appeared first on Dogster.